Size: M3 M4 M6 M5 M8 M10 M3.5 M12 M16 M20 1/8" , 5/32" , 3/16" , 1/4" , 5/16" , 3/8", 1/2" , 3/4" , 1"
Size: As per customer reqire. 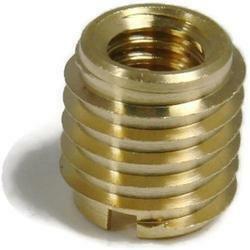 We are leding manufacturer, supplier and exporter of Brass Press In-Inserts for fittings as per our customer requirement or required products drawing.We offer products with our best quality and lowest price.We also cater customize parts as per customer requirement.So, in case any query or requirement , please share with requirement details. 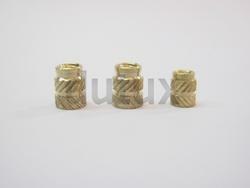 Being a leading firm in this industry, we are deeply engaged in offering a high-quality range of Brass Insert Nut. - Widely used for manufacturing a variety of parts. Size:: 1.1/4" x 1.1/4", 1.1/2" x 1.1/2"
With enriched industrial experience and knowledge, we are providing a wide range of Brass Inserts Hex And Knurling. The offered fasteners are manufactured from best grade raw material with the assist of highly developed technology. Further, these fasteners are tested by our quality testers on distinct parameters in order to make sure their quality. Approx 450 Rs to 1000 Rs per kilogram as per quality and size.